The four bolts provided with some Sniglar cribs to secure the mattress support are not long enough. This can cause the mattress support to detach and collapse, risking entrapment and suffocation. This recall involves about 26,000 cribs. It involves the Sniglar non-drop-side, full-size cribs with model number 60091931. Sniglar, Ikea and the model number are printed on a label attached to the mattress support. The crib frame and mattress support are made of light-colored wood. If the mattress support bolts extend through the nut, the bolts are the proper length and the crib is not included in the recall. 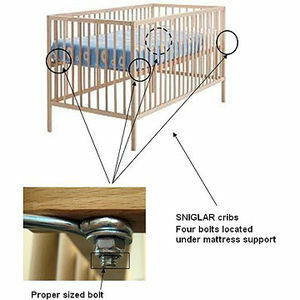 If the bolt does not extend through the nut, the crib is included in the recall. Immediately stop using the crib and check to see if the bolts are the proper size. Contact Ikea toll-free at 888-966-4532 for a free repair kit or visit ikea-usa.com.